I’ve gotten my feet to the street this week, yay! Not only have I been running, but I also downloaded the apps for the 100 push ups & 200 sit ups programs, thanks to J (and NO, I haven’t registered for a full marathon YET, J, so don’t ask!). :D I did the initial test, which totally sucked for me. Hard to believe that 2 years ago I was doing 4 sets of 25 full push ups without a problem, yet I struggled to get 10 done. *sob* Ah well – that’s going to change again! ;) The thing that I really like about the app is I put my iTouch on the ground with me & I’ve got the plan right there – no need to “drop & do 20”, then jump up, go to the computer to see what the next set is to be. 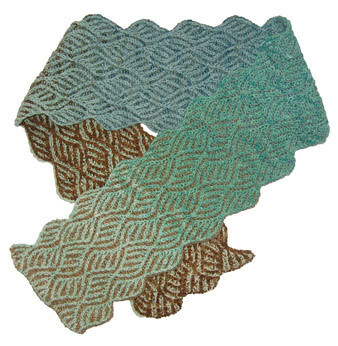 I have leftover yarn from my Doctor Who inspired sock pattern, Ten – and I SO wanted to make a headband using Brioche to give me the same Ten look. I think I finally succeeded, WOO HOO! :D One side looks like his brown suit while the other looks like his blue suit – how awesome is that?! I’m very, very pleased with the end result. 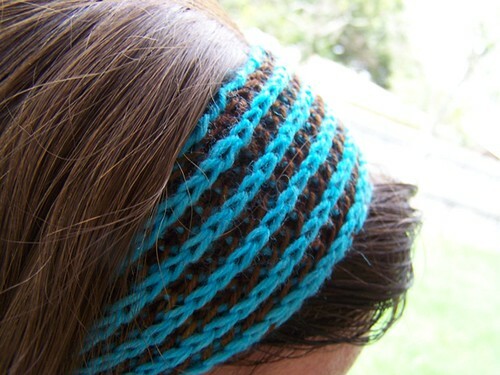 So… how to go about working up a brioche headband? Easy – here we go! 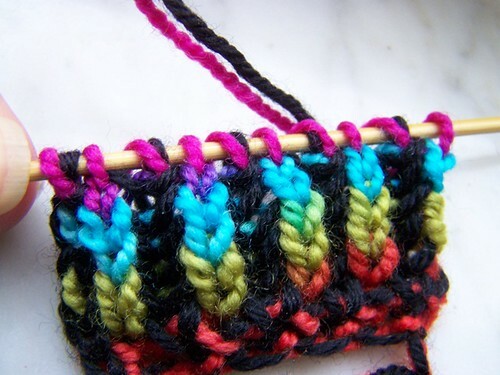 ;) FYI – gauge doesn’t matter for this pattern, as you simply knit until it is the desired length, then sew the ends together. First we need to do the setup rows – you only need to do these 2 “rows” this one time. For these instructions, I’m going to call the black yarn in my photos the main color (MC) and the variegated yarn the contrasting color (CC). Setup Row 1: With the MC, *P1, S1, YO* to the end. Do not worry if your yarnover slips off the needle at this point. Setup Row 2: Slide the stitches to the other end of the DPN. With the CC, *WYIF, S1, YO, bring yarn to the back and BRK* to the end. At the very end, make sure to include the MC yarnover in the final stitch. Now that you have the setup rows done, you can proceed to the stitch pattern you will follow for the remainder of the project. 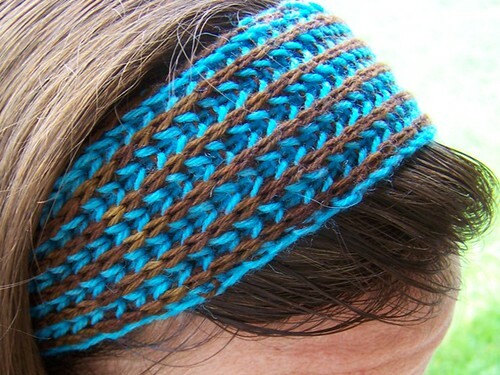 Continue in this pattern until your headband is the length you desire. I prefer to keep it to about an inch too short to fully meet when I wrap it around my head because it WILL stretch with use. Each row is worked twice – one time for each color. 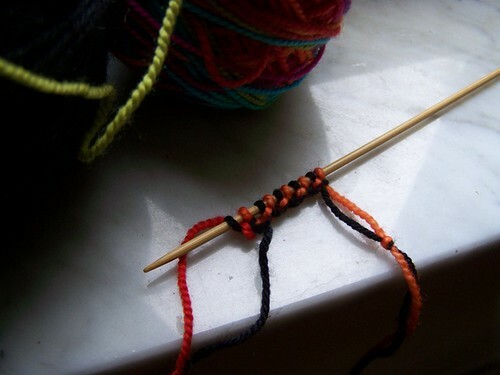 So first, you will work the MC across – then slide the stitches back to the other end of the needle & work the CC across to complete the row. At the end of the 2nd pass through, you will turn your work like you normally would. Using the MC – *WYIF, S1, YO, BRP* to the end. Slide stitches to the other end. Using the CC – *BRK, WYIF S1, YO* to the end. Turn. Using the MC – *BRK, WYIF, S1, YO* to the end. Slide stitches to the other end. Using the CC – *WYIF, S1, YO, BRP* to the end. Turn. 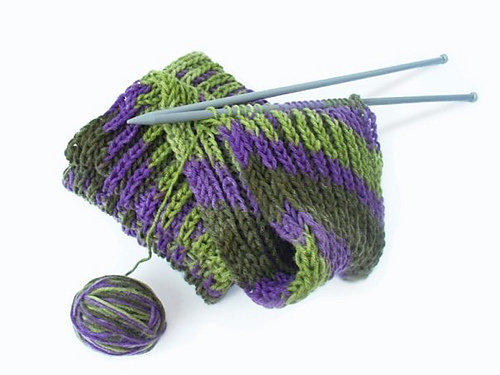 Using a larger needle (I used size 4 – 3.5mm), you are going to bind off using both your MC and the CC. The key is that you will be working this row with the opposite color. BRK with CC, then P with the MC. 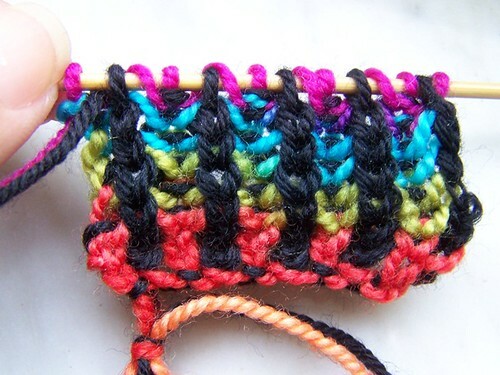 Slip the CC stitch on the right needle over the MC on the right needle to bind off 1 stitch. Now BRK with the CC and slip the MC on the right needle over the CC to bind off the next. P with the MC, then BRP with CC. Slip the MC stitch on the right needle over the CC on the right needle to bind off 1 stitch. Now P with the MC and slip the CC on the right needle over the MC to bind off the next. Interested in more brioche? How about one of these patterns? ;) These aren’t mine – just click the picture to reach the Ravelry pattern page! 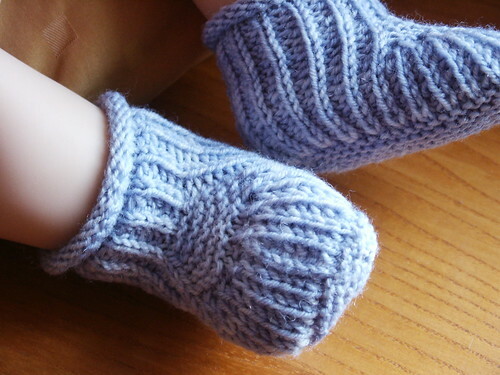 * The pattern that started it all for me - they are TOO cute! * Scarf! 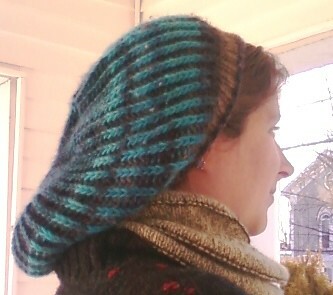 This one is single color using variegated yarn - nice! This scarf pattern? I *love* it & have since I first saw it! 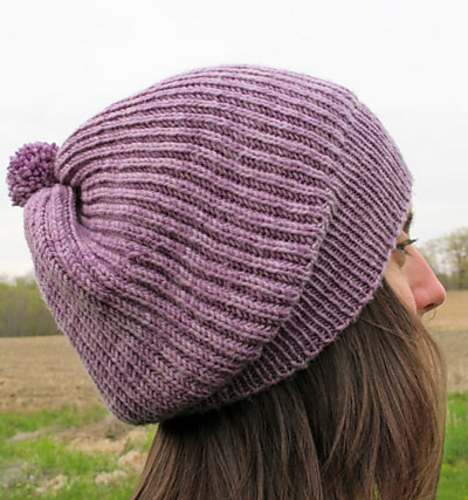 * Jesh's adorable tam pattern! I love it! 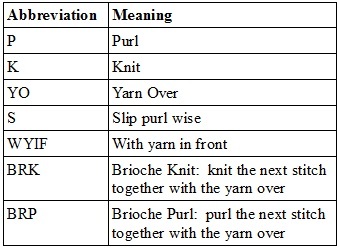 See, you can even make shawls using brioche! Nice! * Another baby brioche cardi - also very cute! Ah, Lily Chin - how I love thee! :) Such a pretty wrap, isn't it? 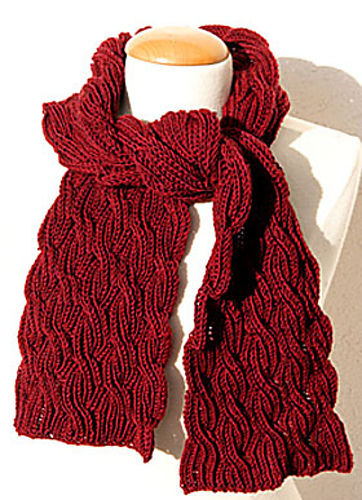 * Gorgeous scarf! 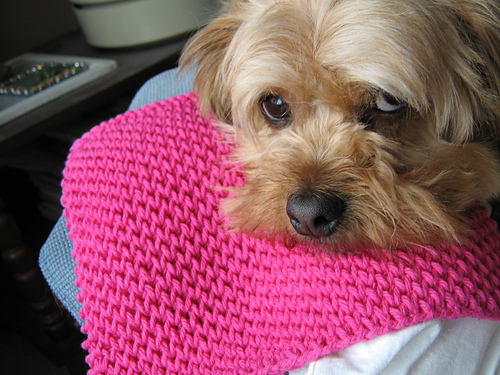 Pattern is available in both German and English. 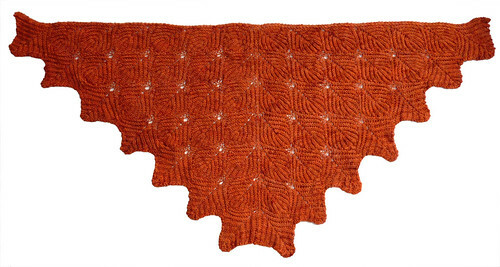 This entry was posted in Running and tagged Brioche, Doctor Who, Free Patterns, Knitting, Running, Today's Ravelry Search. Bookmark the permalink. 15 Responses to Brioche, You are Not the Boss of ME! COOL! another awesome technique to try out! There’s a way to zero out the timer. I never tried it before, but go to Setup, Timer Reset Options. Set it to On. You’ll be pressing the +30 sec button soon enough. Just discovered your blog – happy am I! Awesome! Welcome to my rambling world. :) The more, the merrier – I love getting feedback, so comment away! 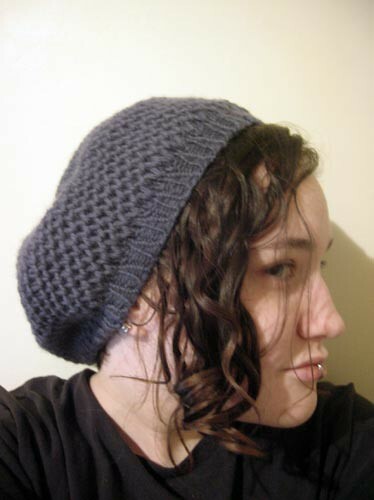 I just came upon your site by accident looking for a hat pattern, but I love you already! I am running my 17 half marathon in 4 years in February. My daughter and I are running a full Marathon in May. I have never seen this Brioche technique before and I am dying to try it. Hello! I just bought Nancy’s book on brioche and am excited to try it. I am a knitting runner too, or a running knitter, or however we want to say it. Glad you are combining your two passions! Too bad we can’t do them at the same time. Now off to read some more of your blog! LOL, I’ve often wished there was a way to knit & run at the same time, I confess. But then I realize that the sweat on the yarn would just be awful. :D I hope you enjoy my odd mashup of a blog!